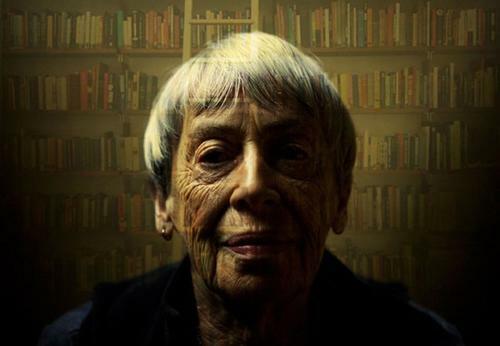 The literary world lost a genre-defying icon last week with the passing of Ursula K. Le Guin. The author of scores of children's books, short stories, poetry, and essays, her voice—and her outlook on the power of stories in general—was both beloved by and a guidepost for writers and readers alike. Below, some of our librarians and library staff pay tribute to the power and beauty of her words and stories. "The Ones Who Walk Away from Omelas, Ursula K. Le Guin’s 1973 short story, is one of, if not the most, beautifully provocative work I’ve ever read. I can’t think of a piece that has moved or challenged me more. It’s a devastating and riveting story about morality that resonates deeply in the 21st-century United States." "In Le Guin’s introduction to The Left Hand of Darkness, she writes: 'In reading a novel, any novel, we have to know perfectly well that the whole thing is nonsense, and then, while reading, believe every word of it. Finally, when we're done with it, we may find—if it's a good novel—that we're a bit different from what we were before we read it, that we have been changed a little, as if by having met a new face, crossed a street we never crossed before.' My heart ached when I first read this perfect encapsulation of the experience of reading fiction, and it aches now that the world has lost this most enchanting storyteller." "Ursula Le Guin's books are in my constant rotation. Her books are more like companions, old friends, touchstones. Did you ever feel like you were in a long—years-long, lifelong—conversation with an author through their writing? Every few years, I revisit Earthsea, Le Guin's masterfully crafted world where a lowly goatherd emerges from a backwoods mountain village to become the greatest wizard in the world. It may seem like well-trod territory by now, but Le Guin did it best, and to this day, the wizard Ged is one of the few dark-skinned main characters in a very White canon of wizard stories. And every few years, I revisit Urras and Annares, the capitalist world and anarchist moon in The Dispossessed, Le Guin's answer to the question, 'What would an anarchist society look like?' When I first read The Dispossessed in my early 20s, I had never read a book that mirrored the same questions that I had about feminism, anarchist politics, and how it all coexists with the need for love and human connection. Upon each reading, I grasp new levels of the political complexities of these vastly different worlds and their inhabitants. And Le Guin, in contrast to other—let's face it: male writers of science fiction—knows that you can't have politics without love. The Dispossessed is a love story—love of home, of freedom, of revolution, and of each other. Ursula K. Le Guin brought us new worlds with razor-sharp wit, an impressive brilliance of mind, and a tender heart, and our world is a better one because of her. "I first became a fan of Ursula K. Le Guin when learning about her father, the famous anthropologist Alfred Kroeber, when I was an anthropology major in college. Her middle initial ‘K’ stands for Kroeber. Le Guin was the first woman science fiction writer I had encountered, and besides being blown away by her work, I felt inspired by her ability to excel in a male dominated field. She also paved the way for current women sci-fi and fantasy writers, like Nnedi Okorafor, author of the Akata Witch series, which I am reading and enjoying right now! My favorite Ursula K. Le Guin book is The Lathe of Heaven." "I’d been into science fiction and fantasy—books, comic books, movies, playing D&D—since high school, but it wasn’t until I was introduced to Le Guin’s books in college that I realized how much more genre fiction could be. The first book I read by her was The Left Hand of Darkness and her ideas on society, prejudices, and sexual politics were all eye openers for me. Probably my favorite of her books would be Rocannon's World with its combo of campy 60s imagery mixed with the social and sexual messages she would begin to raise throughout the majority of her work and the literary worlds she created. And Le Guin didn’t just have one trick up her sleeve either: she was also a prolific public speaker, poet, and even penned children’s books. That last category may be the most surprising, but I can assure you no less amazing than any of her other work. My son has been mesmerized and entertained by the Catwings series on more than one occasion during bedtime storytime. 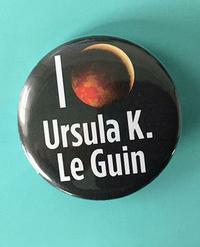 Ursula K. Le Guin truly transcended what an author could be and do with their thoughts and words." "One of the few things that comes up when my name is Googled is a review I wrote of Catwings as an eight-year-old that was included in a 1997 publication called Kids Review Kids’ Books." "Ursula K. Le Guin’s novels and stories challenged so many notions of gender, sexuality, love, property, and individualism programmed in me as an American living in modern times and I am forever thankful for her work. Her worlds are both fantastic, yet exceedingly humanistic and grounded. I’m sad we are losing the woman who held the mirror of humanity up for us and asked us to gaze within. She will be dearly missed." Ursula K. Le Guin, author of science fiction, fantsy, children's books, short stories, poetry, and essays, left this mortal coil last week at the age of 88.